As I wrote about last week, Amazon announced that it would be closing its Kindle discussion forums. The original closure date was listed on a banner as October 6, 2017. When announcing the discussion forum closure, Amazon had promised a new, improved experience in the Kindle Help forum on October 9, 2017. As I noted in my last post, the main difference between the two is that the Kindle customer discussion forum included off-topic discussions and was a separate forum from the official Kindle help forum. Amazon actually closed the forums on the original date, Friday, October 6th. Amazon did the same thing to the forums on IMDB.com, announcing one date and then closing the forums in advance of the deadline. (And, no, users were NOT happy.) Amazon seems to have closed ALL of customer discussion forums as of Friday. All of my bookmarked pages are returning error messages. The newly redesigned Kindle Help forum is now up and running. It has a very different interface that the old one and includes sections for the Kindle, Fire, Fire TV, Echo and Alexa, and Digital Content. 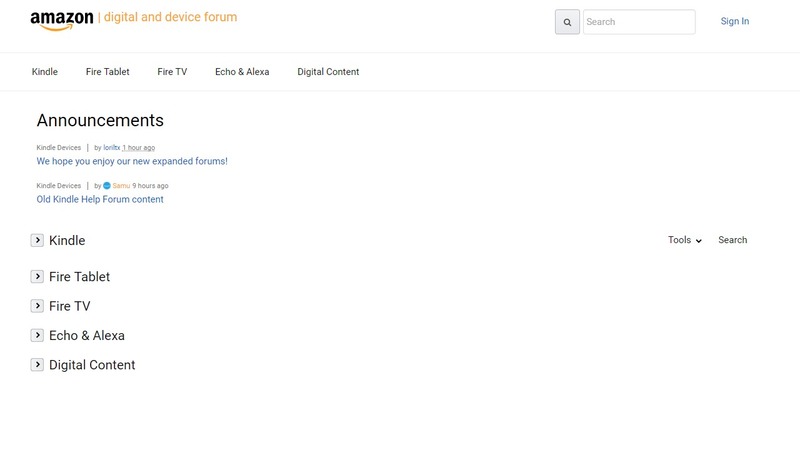 The forum also has its own unique (and easier to remember) URL: amazonforum.com. For now at least, the old forum URL still works and redirects to the new domain name. Have you checked out the new forum design? What do you think? This entry was posted in Kindle and tagged Amazon forums, discussion, forums, Kindle help. Bookmark the permalink.